Fast colour stationery pack printers, online business stationery pack print prices for full colour, letterheads, business cards, compliment slips etc printed and delivered to England at very competitive prices. Fast online one, two and full colour business stationery pack printers of business stationery including letterheads, business cards and compliment slips at low printing prices. UK nationwide stationery pack printing service with online prices. 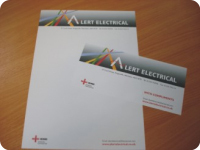 We supply stationery packs throughout the United Kingdom. All stationery printing prices include delivery. Stationery pack printing including fast next day delivery to England. Business stationery packs offer fantastic value for money and allow you to present a first class image. Each business stationery pack has business cards printed in full colour on one side on a heavy 400gsm card (PEFC Certified), with A4 Letterheads and compliment slips printed in full colour on one side on a laser guaranteed 100gsm bond (FSC Certified). Competitive low-cost full colour stationery pack printing prices on either a fast 3 to 5 day print service, or a 7 to 10 day print service. Full colour one sided stationery packs standard, A4 letterheads and DL compliments slips printed onto 100 gsm lazer bond paper and thick business cards onto 400 gsm quality card. How to upload PDF artwork for your printed stationery packs. Design and artwork. Let our creative design team design you effective professional looking artwork for your stationery pack. Free business stationery artwork proofing and client area. We offer a competitive nationwide business stationery printing service to the following areas in the United Kingdom.